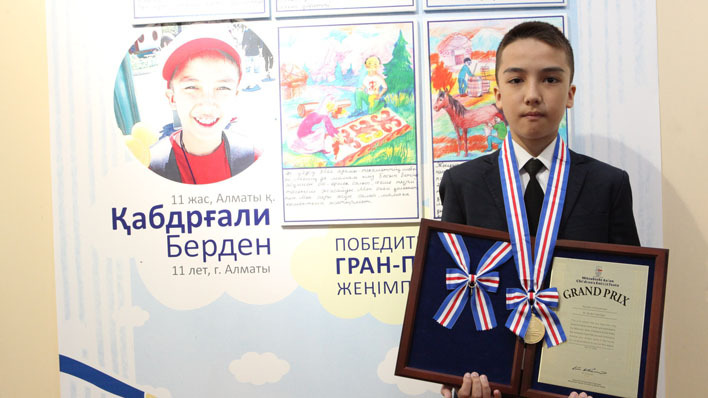 On 31 March 2017 the first exhibition of the International Festival «Mitsubishi Asian Children’s Enikki Festa” was opened at the Central State museum of the Republic of Kazakhstan.The exhibition is dedicated to the celebration of 25th Anniversary of the National Commission of the Republic of Kazakhstan for UNESCO and ISESCO and the 70th Anniversary of UNESCO Clubs movement. This project has been organizing since 1990 for the promotion of cultural and educational programs of UNESCO with the aim of establishing and preserving intercultural understanding throughout children's art. Since the moment of its establishment around 700 000 children from 24 countries of the Asian-Pacific region took part in the contest by presenting five happy days of their life accompanied with short fascinating essays. Organizers of the «Mitsubishi Asian Children’s Enikki Festa» are the National Federation of UNESCO Associations in Japan in cooperation with the Asian-Pacific Federation of UNESCO Clubs and Associations and supported by Mitsubishi Corporation. The Republic of Kazakhstan joined this project in 2008. The national operator of the contest is Kazakhstan National Federation of UNESCO Clubs with the support of the National Commission of the Republic of Kazakhstan for UNESCO and ISESCO and UNESCO Office in Almaty. In the framework of the launch of new cycle of the “Mitsubishi Asian Children’s Enikki Festa 2017-2018” the Exhibition presents paintings of the winners of 2015-2016 years from countries such as Bangladesh, Bhutan, Brunei Darussalam, Cambodia, China, India, Indonesia, Korea, Lao, Malaysia, Maldives, Mongolia, Myanmar, Nepal, Pakistan, Philippines, Singapore, Sri Lanka, Taipei, Thailand, Timor-Leste, Viet Nam, Japan and 8 finalists from Kazakhstan. Honorable partners of the Kazakhstan Federation – Director of the UNESCO Almaty Office Mr. Andrey Chevelev, representatives of the National Commission of the Republic of Kazakhstan for UNESCO and ISESCO and Central State museum participated at the opening ceremony. In their farewell speeches special guests wished to all children further creative development and expressed hopes for their capability of building bright, peaceful and sustainable future for Kazakhstan and the whole Asia. Moreover, three winners of the project from Almaty were awarded with memorable presents from the organizers and new members of UNESCO Clubs received their UNESCO Club membership passports and badges. In accordance with the UNESCO family traditions to support each other, students of P.Chaikovskiy Almaty Music College accompanied the ceremony with the notes of rhythmic music. In order to promote the intercultural dialogue through introducing guests and citizens of Almaty to the life and culture of Asian countries, the exhibition is being held in the framework of 25th Anniversary of National Commission of the Republic of Kazakhstan for UNESCO and ISESCO and 70th Anniversary of UNESCO Clubs movement. The exposition will be available until 14 April 2017 at the Central State museum of the Republic of Kazakhstan.